Nassim Haramein's lifelong journey into the geometry of space-time has lead to a coherent understanding of the fundamental structure of the universe. 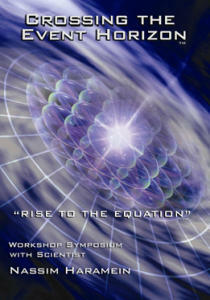 3.0 Everything is a Black "Whole"
In this 4 DVD presentation, Nassim will take you on a journey through humanity's evolution, exposing the changes necessary to produce an all-encompassing Unified Physics; a unification of not only the four forces of nature, but also evolution and the occurrence of consciousness. Demonstrating the parallels between this theory and ancient codes found in documents and monuments, Nassim weaves a tale which may prove to be one of the most important discoveries of our time. Have you ever wondered why those science classes were at all important? Were you ever curious about the mysteries of Ancient Egypt? What about the modern mystery of crop circles? Included on every disc is a series of special features to expand your understanding of this incredible body of work. Great book, for those who may wish to preview his work there are many u-tube videos available. Just type his name in the search and sort by date to get his most current observations.